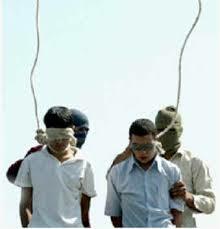 Iranian gay teens Mahmoud Asgari and Ayaz Marhoni being prepared for execution by hanging in 2005. Two gay men were executed today in the city of Rasht, Province of Gilan. Broadcasting diet: General Mdyrrvadt announced that two men, aged 28 and 30 years of Gilan in Rasht Central Prison were executed today. The two men guilty of unlawful acts, Rahimi said. Islamic acts as a crime in the Islamic state is usually used to suppress and execution of homosexual.